Alain Dufont is a Breton bandit leader residing in Raldbthar. The previous lover of Muiri, it turns out that he was only exploiting her and her friendship with the Shatter-Shield clan in Windhelm. He robbed the Shatter-Shields while they were vulnerable and mourning for their daughter's death, and fled, leaving Muiri behind to take the blame. Desperately wanting revenge for her ruined reputation and shattered friendship, Muiri contacted the Dark Brotherhood to end Alain's deceiving ways. He wields a frost-enchanted warhammer named Aegisbane and wears fine clothes along with a pair of fine boots. 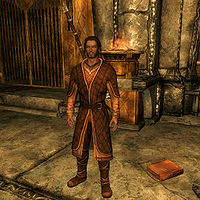 As a target of a Dark Brotherhood assassination, Alain can be found either cooking or sitting in the main chamber of the Ruins of Raldbthar at any hour of the day; he will never be asleep during this time. If you talk to Alain, you will be given only three dialogue options. Be aware that only one can be chosen as each ends the conversation. If you choose to remain silent, he will respond, "Ha! My opponent is so paralyzed with terror, no words will come. Let's be done with it, then!" If you tell him he will die as he lived, calling it 'an arrogant joke', he will reply, "A joke? Alain Dufont... a joke? I am a king on my throne, and you, my friend... you will die slowly, and painfully." If you tell him that Muiri says goodbye forever, he will answer, "Muiri? Muiri? So, what, you're the cow's champion? Oh, now that is rich. Well then, champion, let's get this over with." After his death, guards may comment as you pass, "Hey! You're the one who killed Alain Dufont, up in Raldbthar. Oh yeah, word about that got around. Man was a piece of bandit trash, is what I hear." Alain was originally intended to act as an opponent in the unused Windhelm arena, provided he hadn't already been killed. However, Alain just remains in Raldbthar since the arena was not implemented in the final game. This page was last modified on 5 August 2013, at 22:23.